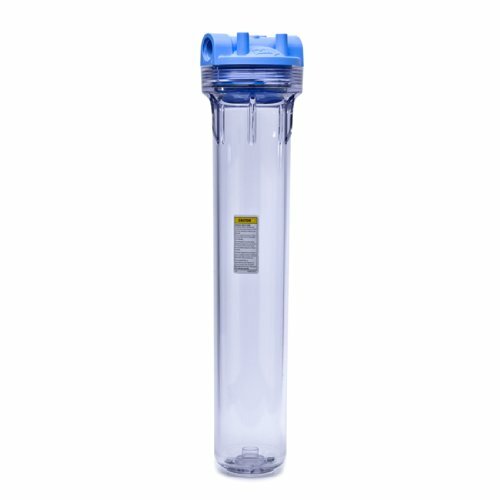 This Pentek 150560 3/4" #20 3G Standard clear filter housing with pressure relief is suitable for residential, commercial, and industrial applications. The sump is made of clear styrene-acrylonitrile (SAN) for on-site viewing of flow and cartridge condition, and the cap is made of reinforced blue polypropylene for strength and resistance to chemicals. The cap has 3/4" female National Pipe Thread Taper (NPT) threaded input and output connections and a nitrile butadiene rubber (Buna-N) O-ring to ensure a watertight seal. A pressure relief button on the inlet side of the cap releases pressure in the housing for changing filter cartridges. The housing can be used with a 20" x 2-1/2" sediment or carbon filter cartridge (sold separately). It has an initial pressure drop of 1 pound per square inch (psi) at a flow rate of 10 gallons per minute (gpm), a maximum operating pressure of 125 psi, and a maximum operating temperature of 125 degrees F (51.7 degrees C). This filter housing is for use in various applications, including residential drinking water filtration, food service, and humidifying systems, among others.